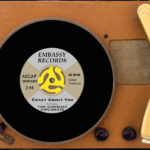 A gaggle of amiable ambassadors, creative consuls and various charming charge d’affaires recently gathered in the elegantly appointed embassy at Zoe Tribe Studios to make some of our notorious noise. While ensconced in our sturdy recording redoubt, we laid down a scintillating standup bass track and some fabulous female backing harmonies for a couple of extra-super-groovy new tunes that we’re toiling over. We also had the pleasure of once again working with Kenny Hamilton, the jazz-trained king of the sax axe, who played the noir lines on “Obsessive Love,” the Motown licks on “She Made A Move On My Heart,” and the rock ballad arrangement on “Dance With Me.” We marvel at his ability to coax such sublime sounds from the shiny curved sound-making gadget that he plays. From honks and growls to wails and howls, he makes that thing sing. And we wondered, “Whence came this odd contraption?” Apparently, on that day we were speaking in a vernacular from Elizabethan times. Forsooth, the tale of the saxophone, which captivates the ear strangely. Adolphe Sax, inventor of the saxophone, saxotromba, saxhorn and saxtuba. Legend has it that he also invented the three-nozzled bloozer and the Hinkle-Horn. 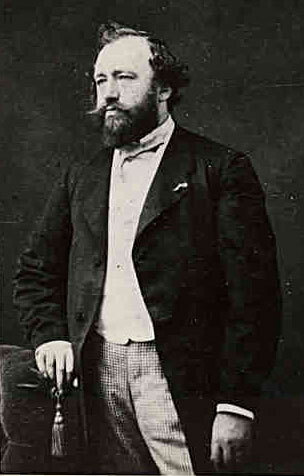 In 1815, Adolphe Sax was born into a family of musical instrument designers in a Walloon city in what is now Belgium. After falling from a three-story building, accidentally drinking a sulfuric compound, nearly being blown to bits in a gunpowder explosion, narrowly escaping suffocation from varnish fumes, and nearly drowning in the river, his kindly neighbors referred to him as “little Sax, the ghost.” Adolphe managed to survive and, in 1846, created the saxophone, which projected like a brass instrument but offered the agility of a woodwind. Although made of brass, it has a single reed like a clarinet, making it the duckbilled platypus of wind instruments. Although it never really caught on with symphonies, the powerful sax did find a place in marching bands. In the early 1900s, Rudy Wiedoeft’s virtuoso vaudevillian/ragtime style on songs like “Saxophobia” won the saxophone wider popular appeal. And the instrument’s versatility slowly gained it a home in jazz, where it became a staple from swing orchestras to bebop combos. With rock’s advent in the fifties, it became ubiquitous in most of the early bands, but once electric guitars established dominance, it signaled the beginning of the end of the sax’s heyday as a rock instrument. By the seventies, the saxophone had reached its apex and would begin to wane as an integral part of the standard rock lineup, though it still figured prominently in several high-profile groups, such as Clarence Clemons of The E Street Band on “Paradise by the C,” Alto Reed of The Silver Bullet Band and his melancholy lines on Bob Seger’s “Turn The Page,” and Richie Cannata’s blistering solo on Billy Joel’s “Only The Good Die Young.” But the instrument’s days in the forefront were numbered. Many consider the familiar and dramatic strains on George Michael’s 1984 hit “Careless Whisper” to be the song that finally killed the saxophone’s cool factor in pop music and turned it into a cheesy parody of itself. Perhaps. But the sax certainly had a strong run as a central element in rock for many years. And, of course, we still love it. So, to honor the shiny, curved contraption with all the buttons, here are some iconic saxophone songs from the pop and rock era. Junior Walker on “Shotgun,” which is so funky and good, it needs only one chord…Ab7 to be precise. Boots Randolph channeling King Curtis in his novelty instrumental “Yakety Sax,” which will forever be associated with Benny Hill being chased across the English landscape at double speed. In between positioning microphones, plugging and unplugging various devices, and conducting sound checks, we carved out some time to record a few station promos. 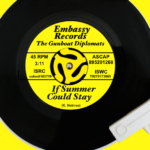 Like the ludicrous short biography we send when marketing GBD music (ie, “The Gunboat Diplomats are the best kept secret on the indie music scene, and will be for the foreseeable future”), we eschewed the typical spoken blurb in favor of something over the top. So our promos include kitschy background music, cartoonish sound effects, and exaggerated voice-overs. For instance, our friends at Field of Nightmares Radio revel in cutting, self-deprecating sarcasm, so we provided: “…Field of Nightmares Radio, they’re under control, below the radar, and beneath your dignity.” But you’ll have to hear the promos on FONR, KBJB, From Texas and Beyond, and Big Indie Giant to experience all the wacky shenanigans, madcap Tomfoolery and zany antics. By the way, radio didn’t always broadcast such silliness. In its early decades, radio announcers stuck to a straight delivery style. But in the mid-50s and early-60s, DJs like Murray the K and Wolfman Jack developed wild, eccentric personas that made the person behind the microphone as entertaining as the music they played. 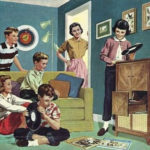 Their popularity opened the door to even more innovation, from brilliant prank calls by Roy D. Mercer, to parodies on The Gary Burbank Show, to ridiculous comedy bits by shock jocks like WAPE AM 690‘s The Greaseman. But the master of them all was a consummate voice man best known for his shtick on the Laugh-In TV show as a straight-laced neck-tie-wearing announcer who, hand cupped to ear like a radio man of old, delivered wacky lines with a delightfully droll tone. 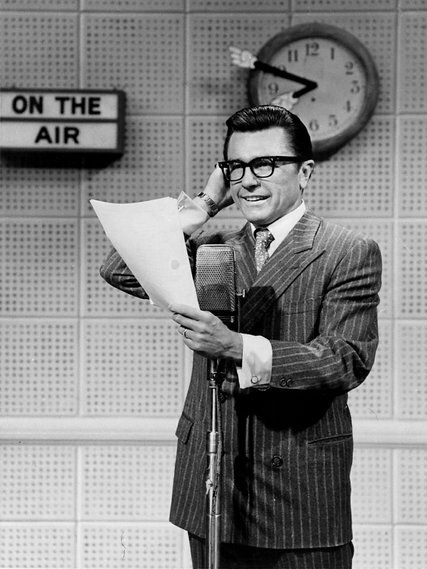 And so, we give full diplomatic recognition to the late, great Gary Owens.